Annie Oakley, "Carnival" and "How To Succeed. . . "
Goodspeed Musicals, under the leadership of Michael P. Price, returns for its 47th season at the Goodspeed Opera House in East Haddam, Conn. with "Irving Berlin’s Annie Get Your Gun" from April 16 - June 27, "Carnival!" 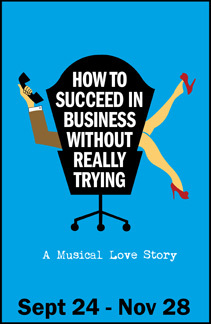 from July 9 - September 18 and the Tony Award-winning "How to Succeed in Business Without Really Trying" from September 24 - November 28. Nestled on the banks of the Connecticut River, the Opera House is an enjoyable day trip from the Greater Boston area. 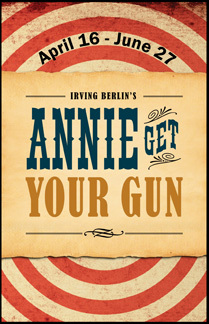 "Annie Get Your Gun," with music and lyrics by Irving Berlin and a book by Herbert Fields and Dorothy Fields (as revised by Peter Stone), follows the backwoods gal with a sure-shot, as she challenges dashing marksman Frank Butler to be the star of Buffalo Bill’s traveling show. Sparks fly as the competition and the romance heats up. With a score that includes such classics as “There's No Business Like Show Business,” “Anything You Can Do,” “I Got The Sun In The Morning,” and “You Can’t Get A Man With A Gun,” the production will be directed by Rob Ruggiero of Goodspeed’s "1776," "Big River"and last summer's "Camelot." Choreography will be from Noah Racey, who starred at Goodspeed in "Where’s Charley?." Racey also served as Associate Choreographer of Broadway's "Thoroughly Modern Millie." 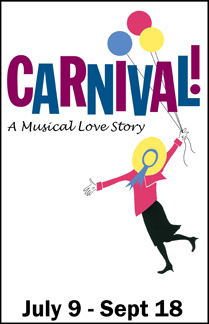 Next, with music and lyrics by Bob Merrill and book by Michael Stewart (with revisions by Francine Pascal), "Carnival!" offers the heartwarming tale of a naive young woman who eagerly joins a traveling circus. Surrounded by a riot of acrobats, jugglers, music makers, and clowns, she is dazzled, at first, by the troupe's manipulative magician. However, in the end, she finds happiness with a disillusioned puppeteer who can only express himself through his puppets. Featuring the song “Love Makes the World Go Round,” "Carnival!" will be directed by Darko Tresnjak, who directed Goodspeed Musicals’ "Amour" and "A Little Night Music." Dedicated to the preservation and advancement of musical theater, Goodspeed Musicals produces three musicals each season at the Goodspeed Opera House in East Haddam, Conn., with additional productions at The Norma Terris Theatre in Chester, Conn., which was opened in 1984 for the development of new musicals. The only regional theater to receive two Tony Awards (for outstanding achievement), Goodspeed also maintains The Scherer Library of Musical Theatre and The Max Showalter Center for Education in the Musical Theater. For information and tickets, stop by the box office, call 860-873-8668) or visit www.goodspeed.org.